Glyphosate resistance was first reported in 1996 from rigid ryegrasss in an orchard in Australia. Subsequently, several additional glyphosate-resistant weed populations have been identified: rigid ryegrass in a wheat production system in Australia and in California; Italian ryegrass in Chile; goosegrass in Malaysia; and horseweed (marestail) in the eastern, midwestern, and southeastern United States. The resistance mechanism in goosegrass is due to an altered target site, whereas the mechanism in the other weeds is under investigation. 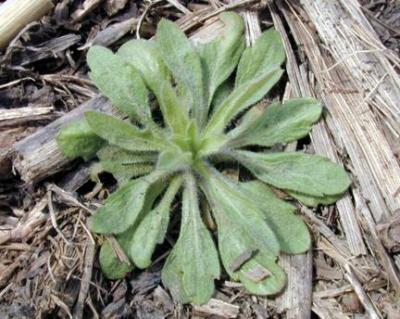 Horseweed is the first weed species to develop glyphosate resistance in Roundup Ready soybean. Glyphosate-resistant horseweed is the first example of a weed developing resistance in Roundup Ready soybean. The resistant biotype first occurred in Delaware in 2000 and since has spread as far west as Indiana. In addition, glyphosate-resistant horseweed occurs in the southeastern United States where Roundup Ready cotton is grown. The first resistant horseweed population originated in a field in which glyphosate was the only herbicide used in Roundup Ready soybean in 1999 and 2000. Before 1999, glyphosate had been used infrequently as a preplant burndown herbicide in no-till systems. The horseweed biotype has exhibited 8- to 13-fold resistance to glyphosate. There has been considerable discussion as to whether waterhemp should be listed as a glyphosate-resistant weed. Research in Iowa and Missouri has documented that within the waterhemp population, individual plants meet the definition of glyphosate-resistant: 1) ability to survive rates of glyphosate lethal to the majority of the waterhemp population, and 2) the trait is inherited. However, we are unaware of populations in Iowa that cannot be effectively controlled with labeled rates of glyphosate, suggesting that "resistant" individuals do not make up a commercially significant proportion of the total population. Glyphosate-resistant weeds have been described by some as "super weeds," and there have even been inferences that glyphosate-resistant weed presence could reduce farmland value. Undoubtedly, the development of glyphosate-resistant weeds will increase weed management costs for growers, but by how much? The impact of glyphosate-resistant weeds will depend upon resistant weed characteristics, primarily the effectiveness of alternative tactics on the species, and how quickly the weed spreads. For most weed species, alternative herbicides are available that are highly effective and provide good flexibility in application timing. For these weeds, a grower could tank-mix another herbicide with glyphosate and continue to use the weed management program used before development of the resistant biotype. Growers who rotate Roundup Ready corn and Roundup Ready soybean already use this approach by tank-mixing Select or a similar herbicide to control Roundup Ready volunteer corn in soybean. The more costly scenario would involve a weed for which the alternative herbicides have limited flexibility in application timing. A weed species that requires postemergence applications before weeds reach a 4-inch height would have a major impact on weed management systems because the loss of application flexibility would present a greater cost to many growers than the additional herbicide expense. The continued growth in farm size increases the importance of application flexibility provided by glyphosate. Since the first report of glyphosate-resistant rigid ryegrass in 1996, four additional resistant species with this trait have been identified. Although not yet one new species per year, this rate of development suggests that we will continue to see new resistant biotypes. Eventually, one of these weeds will occur in Iowa and surrounding states. However, the ability to survive glyphosate does not create a super weed, and there is no reason to use scare tactics to try and change growers' perceptions and practices. We suggest that growers implement a long-term plan to reduce the selection pressure placed on weeds by glyphosate. However, without information on how soon economically important resistance will develop, recommendations to guard against glyphosate resistance in weed populations will not be easily accepted by growers. The simplest way to reduce selection pressure is to avoid planting continuous Roundup Ready crops. Using additional modes of action with glyphosate provides alternative selection pressures on certain weeds, and in some situations, reduces the likelihood of resistance. However, because we do not know which weed is likely to develop resistance, we do not know whether the alternative mode of action reduces glyphosate selection pressure on the appropriate species. Thus, we suggest an annual rotation of herbicides should be the foundation for resistance management. Current glyphosate use in the Midwest makes resistance inevitable. When resistance develops, control of these biotypes will be necessary with existing herbicides because no herbicides with new modes of action will be introduced in the foreseeable future. Several alternative products for use in corn and soybean will reduce the impact of glyphosate resistance, but costs can be high. Thus, evaluating weed management programs in terms of selection pressure placed on weeds should be an important component of crop management planning. This article originally appeared on pages 23-24 of the IC-490 (3) -- March 17, 2003 issue.